Mike Morales and Alex Perez taste and discuss Maestro Dobel Tequila. Dobel was created by and named after Juan-Domingo “Dobel” Beckmann, the eleventh-generation leader of Jose Cuervo tequilas, in collaboration with master distillers (“Maestros”) Marco Anguiano and Luis Yerenas. It was introduced in 2008. Dobel is a blend of reposado, añejo and extra añejo tequilas, aged one, two and three years, respectively, in European white oak barrels, and then filtered to remove all color. The tequilas in the blend are distilled from 100% blue agave from a single estate in Jalisco, Mexico. Technically considered a reposado, it is the first ever multi-aged clear tequila. The original bottle had a crystal-cut glass design with a thick metallic base. The current bottle is modeled after a 19th-century laboratory bottle. Dobel™ Tequila is one of the United States’ fastest growing ultra-premium tequilas. Named after its founder (Dobel is his abbreviated name – Juan Domingo Beckmann Legoretta) the tequila is sourced from single estates and is distilled from 100% blue agave and bottled in Jalisco, Mexico. Each bottle of Dobel™ Tequila is double-distilled, matured in Hungarian White Oak barrels, and filtered for exceptional smoothness and clarity. Dobel™ Tequila is recognized for its superior smoothness and iconic packagingwhich includes a stopper and a modern twist on a vintage apothecary-style bottle, a heavily embossed bottle whose design is inspired by the laboratory sample bottles used by the distillery’s Maestro Tequileros (Master Distillers). Dobel Tequila™ is available nationwide in fine bars, restaurants and retailers – available in 200 ml, 375 ml and 750 ml bottles. The 750 ml bottle will retail for $54.99. 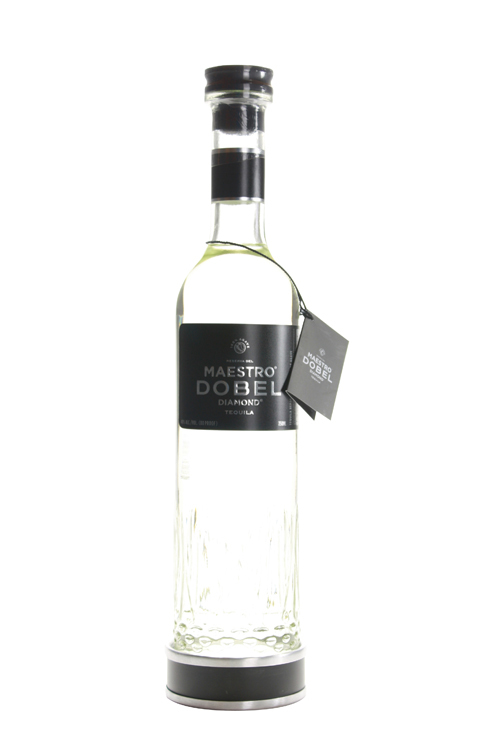 Maestro Dobel Tequila “It doesn’t deliver on the nose”.